DNA damage is an important factor in aging in all eukaryotes. 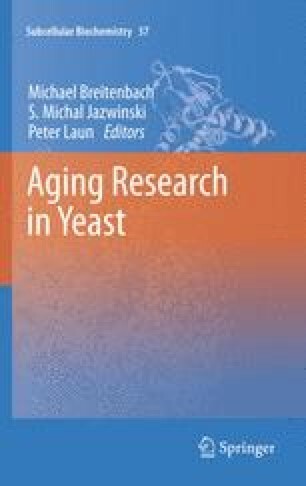 Although connections between DNA damage and aging have been extensively investigated in complex organisms, only a relatively few studies have investigated DNA damage as an aging factor in the model organism S. cerevisiae. Several of these studies point to DNA replication stress as a cause of age-dependent DNA damage in the replicative model of aging, which measures how many times budding yeast cells divide before they senesce and die. Even fewer studies have investigated how DNA damage contributes to aging in the chronological aging model, which measures how long cells in stationary phase cultures retain reproductive capacity. DNA replication stress also has been implicated as a factor in chronological aging . Since cells in stationary phase are generally considered to be “post-mitotic” and to reside in a quiescent G0/G1 state, the notion that defects in DNA replication might contribute to chronological aging appears to be somewhat paradoxical. However, the results of recent studies suggest that a significant fraction of cells in stationary phase cultures are not quiescent, especially in experiments that employ defined medium, which is frequently employed to assess chronological lifespan. Most cells that fail to achieve quiescence remain in a viable, but non-dividing state until they eventually die, similar to the senescent state in mammalian cells. In this chapter we discuss the role of DNA damage and DNA replication stress in both replicative and chronological aging in S. cerevisiae. We also discuss the relevance of these findings to the emerging view that DNA damage and DNA replication stress are important components of the senescent state that occurs at early stages of cancer.